C.V.Wigneswaran appears to be drifting away from the TNA, a party which propped him up. 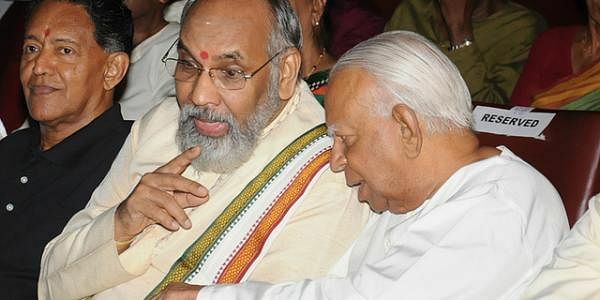 COLOMBO: C.V.Wigneswaran, who became Chief Minister of Sri Lanka’s Northern Province in 2013 thanks to the Tamil National Alliance (TNA), appears to be drifting away from the party which propped him up. Well placed sources in the TNA told Express that the rift, which is being kept under wraps in view of the August 17 parliamentary elections, could surface after the polls. The once apolitical former Supreme Court judge has now developed independent political ambitions. Apparently, he no longer wants to be a lackey of the old war horses of the TNA. After he agreed to get the Northern Provincial Council (NPC) to pass the controversial “genocide resolution” initiated by a radical member, Wigneswaran won accolades from extremists in the Tamil Diaspora. Locally, he is said to be under the influence of the radical Tamil National Peoples’ Front (TNPF) led by Gajendrakumar Ponnambalam. According to some sources, his recent US trip was arranged by a radical group. Recently, Wigneswaran issued a statement saying that he would be “neutral” in the run up to the parliamentary elections thus distancing himself from the TNA. Differences with top TNA leaders came to light when he fought with Mavai Senathirajah over money allocated to MPs by the Central government.TNA leaders have been complaining about Wigneswaran’s administrative incompetence due in part to his failure to interact with Ministers, Departmental Secretaries and Prime Minister Ranil Wickremesinghe. The NPC’s administrative inefficiency has become an election issue. The Sunday Times reported that US Assistant Secretary of State for South Asia, Nisha Biswal, had ticked him off for harping on “genocide” when he ought to be cooperating with the Sirisena government to solve the Tamil question. And India was apparently embarrassed when, against advice, he made a political speech during Modi’s visit to Jaffna.